The Jaguar XJ 220 parts-list seemed more aerospace, than automobile! The body was bonded-aluminium honeycomb - aerodynamically derived from Group C racing. It induced cerebellum-shifting acceleration. Indeed, the XJ was named the '220', for the mph top speed it so rapidly reached. It was Jim Randle - Jaguar's chief engineer - who conceived the car. He coaxed a few colleagues into spending Saturdays on the project. Things were looking good for the 'spare-time' supercar! The 220's racing credentials were clear to see. Keith Helfet's svelte bodywork was for starters. A 5-speed transaxle ran through an AP clutch. Alloy wheels were centre-locking - for speedy wheel changes. Hefty brakes had 4-piston calipers. There was wishbone/inboard suspension. Power output was 500bhp! In theory, at least, though, the XJ was a roadster. Jaguar teamed up with TWR - to found JaguarSport. A production facility was built - in Bloxham, Oxfordshire. 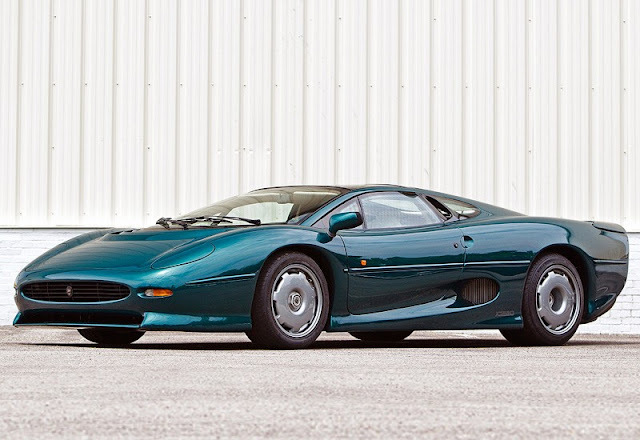 350 XJ 220s rolled out of it. Each with a price tag of £403,000! When the prototype had appeared - at the '88 Birmingham Motor Show - it triggered a tidal wave of excitement. Jaguar were besieged by orders. But when the supercar bubble burst, panic set in! Lawyers were loaded down - as buyers tried to wriggle off the XJ's high-priced hook. What had begun in Whitley, West Midlands, had morphed into a story more suited to Hollywood. A sideline - to keep boffins' brains busy - was now a case study in Eighties excess!